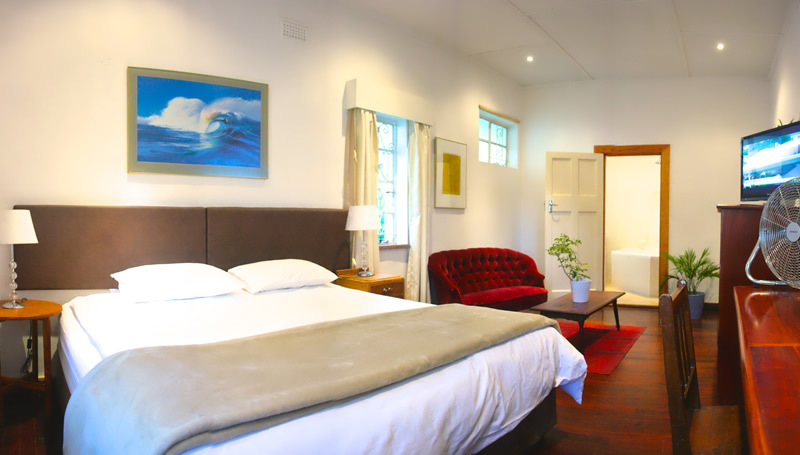 At Travellers Guest House, a friendly smile and efficient service accompany our exceedingly comfortable and attractive rooms with spotless en-suites. Enjoy charming décor and delicious food in a lush, tropical garden setting. 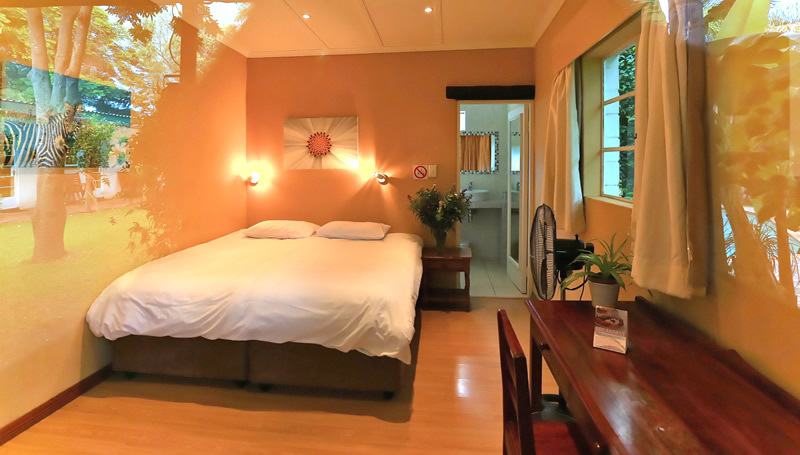 Travellers offers free WiFi, self-catering facilities, power & water backup, sparkling pool and 24hr Security, all conveniently located close to shops, restaurants and town. Guest comfort is our top priority – enjoy pristine bathrooms, Restapedic beds, allergen-free microfiber pillows & duvets, and crisp clean 100% cotton linen. 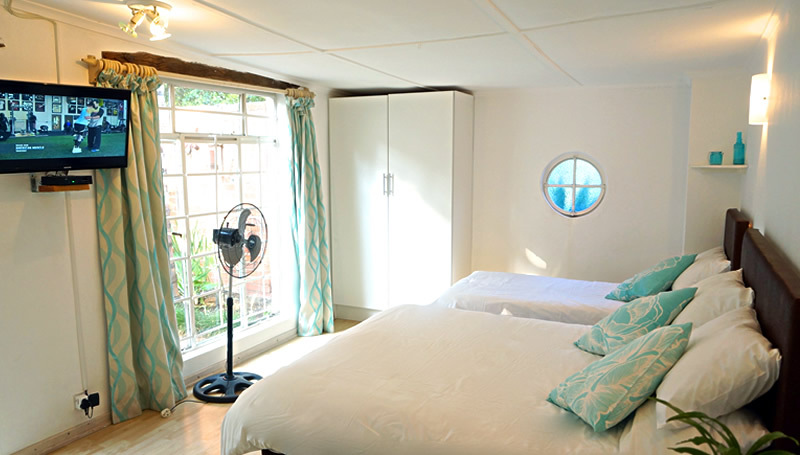 A comfortable nights sleep comes standard at Travellers Guest House. Artfully decorated rooms have fans, a work desk with WiFi, and piping hot showers. 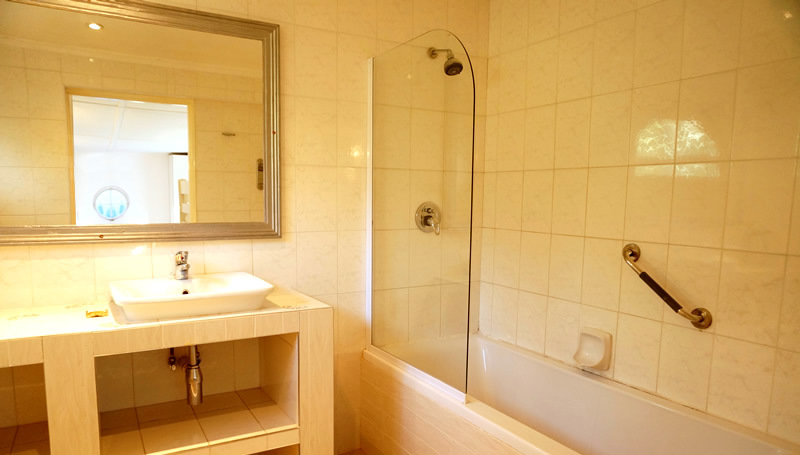 In addition, suites and family rooms are spacious, have DStv, bath, and tea/coffee station. Delicious full-english is served in the breakfast garden, or the elegantly decorated dining room. A modern, fully-equipped guest kitchen is at your disposal, while four restaurants are within strolling distance. Relax by the sparkling pool, kick back in the entertainment lounge, or enjoy a traditional meal at our shady outdoor braai area. Our free booking & information service is at your disposal to arrange taxis, airport shuttles or Matobo NP tours. 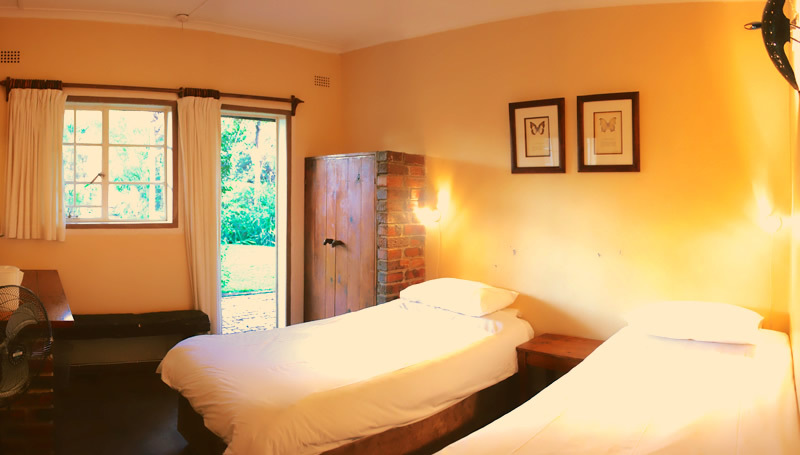 We look forward to welcoming you to Travellers Guest House! We hope you enjoy our free WiFi available throughout the property. Our guest kitchen is clean, modern, fully-equipped and at your disposal. There is ample fridgeration and storage space for your foodstuffs. The TV lounge is equipped with a big screen and full HD DSTV. This outdoor braai/function area is available for guest, with plenty of tables and seating in the shady garden. There is also a fire-pit for spinning a yarn on those chilly evenings! Cool off and catch some rays on the sun patio! Start you day with a steamin’ cuppa coffee or tea, available throughout the day in the dining room. Just let reception know the day before what time you’d like the wake-up. Don’t miss our tasty, full-english breakfasts prepared by Proud, our resident chef! The $5 Continental buffet consists of coffee, teas, toast and jams, along with a choice of cereals, yogurt, fruit, muffins, scones and rusks. The $10 Full English is as above, followed by two eggs as you like them, sizzling streaky bacon, tasty sausage, fried tomato, baked beans & hash browns. 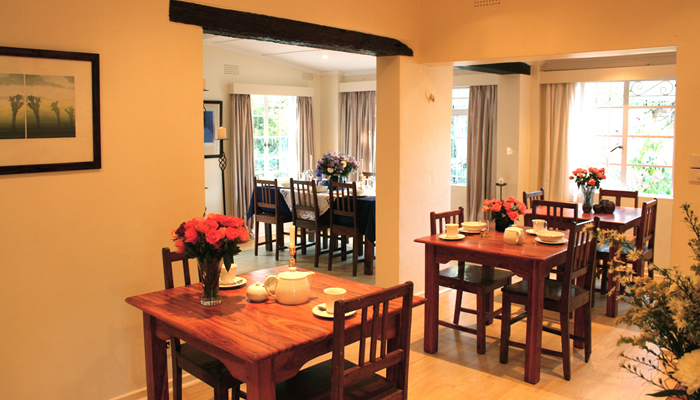 Dine in our cosy cottage, or request an outdoor table in the delightful breakfast garden. Packed breakfast, kids breakfast or health breakfast is available on request. Breakfast is served from 07:00 till 10:00, but should you have special requirements, please inform reception, every effort will be made to accommodate. Travellers provides meals on request – packed lunches, group meals. etc. Tasty, home-style cooking at affordable prices! Our shady braai area is ideal for your function. Allow our staff to prepare the perfect bed of coals and lay out a feast, or you’re welcome to do your own catering. There are several good restaurants just a short stroll from Travellers, including the New Orleans Restaurant, located right next door. Please let reception know if you’d like a complimentary car-wash or shoe-shine! 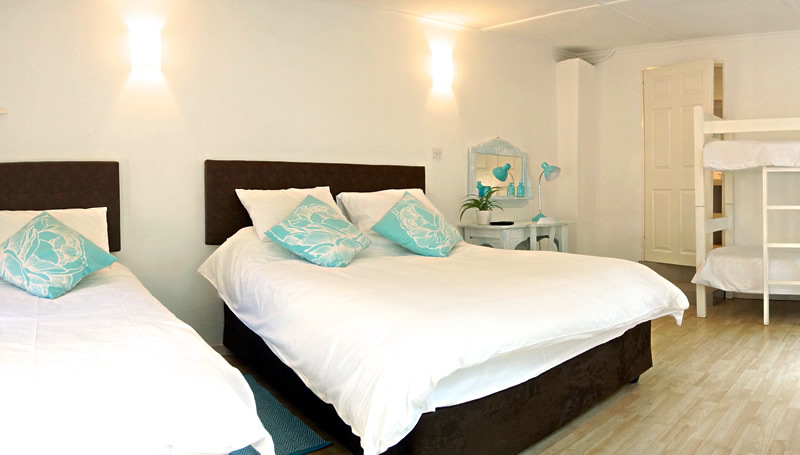 Travellers Guest House can recommend things to do, places to go and where to eat. If you’d like a booking made, taxi reserved or tour booked then just ask reception and we’ll take care of it at no extra cost! We work with tried and tested service providers, both local and countrywide. Forgot your toothbrush? We have a selection of essential items available for purchase from reception, including toothbrush, toothpaste, shampoo, conditioner, cream, hygene products and insect repellent.